Tukwila Parks and Recreation - Good, Healthy, Fun! 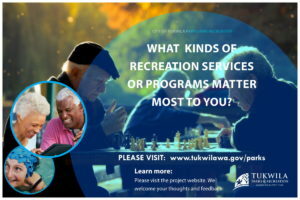 Welcome to Tukwila Parks and Recreation, please follow the links on the right to navigate parks, places and programs. The mission of the Tukwila Parks and Recreationis to enhance the quality of life for residents, businesses and visitors through a quality system of public spaces, programs and events that enhance and promote opportunities for health and fitness, personal growth, relaxation, community connection, civic engagement, and environmental stewardship. Tukwila Parks and Recreation is home to 159 acres of parks, 12 miles of trails, Foster Golf Links, and the Tukwila Community Center. The department develops and maintains parks and facilities, and offers a wide range of recreational events, programs, and services for all ages.